We are offering our clients the best Universal Two Wire Transmitter. These low power components model 872 are designed over low drift. 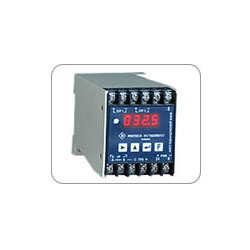 The offered transmitters are precisely designed and developed to accept universal type RTD/ hermocouple like temperature inputs or linear inputs. These products also provide 4-20mA DC signal on the same two wires, that carry the 24 V DC. Furthermore, these are provided with a local 4 digit LCD/LED display that show input signal value as configured for. These are also provided with front keys through that all configurations such as input signal type selection, ZERO and SPAN adjustments for display range and outputs can be done. The output signal of 4 – 20mA DC is able to bear pressure up to 800°, thereby eliminating requirement of compensate cable or three core cable between the field and control room. CJC compensation is provided for thermocouple inputs. With respect to input temperature signal, the output is linear. We offer these transmitters in field mounted/panel mounted housings. Looking for Universal Two Wire Transmitter ?